Have all packing materials and have everything that was originally in the box, including, all accessories, manuals and warranty cards, etc. If any shipment is rejected by a customer during the attempt of delivery, customer then will be liable for all shipping and handling costs both-ways (from and to customer shipping address) plus $20 or %10 handling fee whichever is greater. 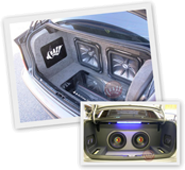 All Returned products will be inspected by Crazy Stereo before any credit or exchange is approved, Crazy Stereo reserves the right to refuse any returned package that does not have an RMA number or improperly packaged. If a returned item appears to may have been used, partially used, installed and or tested by the customer. If the returned item is missing parts, accessories, manuals, warranty cards, installation parts, etc. If the item is returned with minor blemishes or damages. Customer is responsible for all shipping and handling costs for all returned items both-ways (from and to customer shipping address) even if the customer was not charged the original shipping. Partial Return: If for any reason a customer returns part of a package or a promotion and decides to keep the rest of the items that were purchased as part of this package or promotion, then the customer will be charged the price difference on each individual item at the original individual price. Radar Detectors and portable products. Return Procedure: In order to return an item to Crazy Stereo, the customer must first obtain an RMA number by filling out the RMA form in the “Contact Us” tab on the website. Once an RMA form is submitted, it may take up to 7 working days to issue it. The returned item must be properly and securely packaged with the RMA number and a return address visible outside the box next to the shipping label. Damaged items due to bad packaging or while in transit may result in denial of return. Damaged packages will be rejected. We recommend that you purchase shipping insurance from the shipping carrier on your returned package. Crazy Stereo is not responsible for any lost, stolen or damaged products during the return shipping process. Once the returned package is accepted it may take 7 to 10 business days to inspect the returned product and process the refund or exchange.